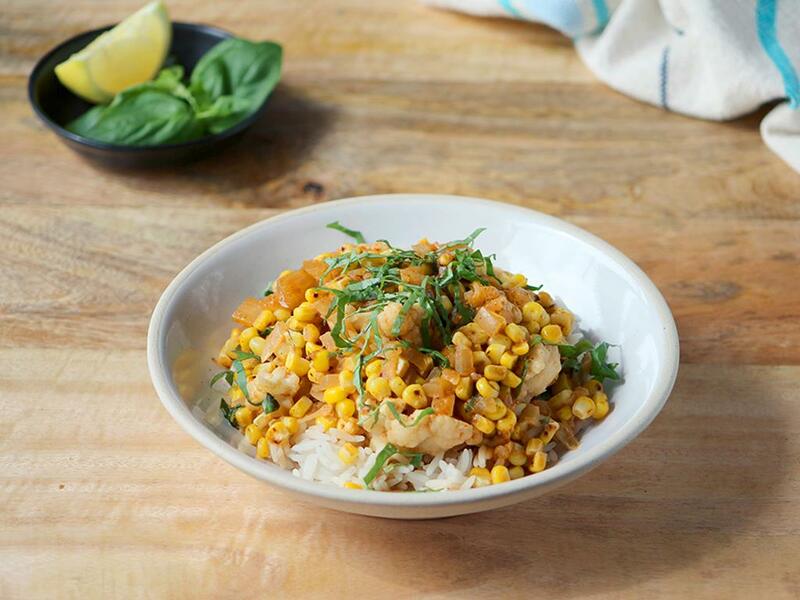 Spicy Massamun curry with sweetcorn, basil and cauliflower, served on a bed of brown rice. Massamun curry: Place a pan on medium-high heat with a drizzle of olive oil. When hot, add the onion with a pinch of salt and sauté for 3 minutes, before adding the sweetcorn kernels. Sauté for another 5 minutes until golden. Add the cauliflower with the Massamun Curry Paste (spicy – use to preference), then stir in the coconut milk and water (½ cup for 4; ¼ cup for 2). Simmer (gently boil) for 3-5 minutes until the cauliflower is cooked. Slice the basil leaves finely, add to the pan and mix through. Season to taste. Serve the brown rice topped with the Massamun curry and a squeeze of lemon juice.